Travelling from Durban, take the N2 South. 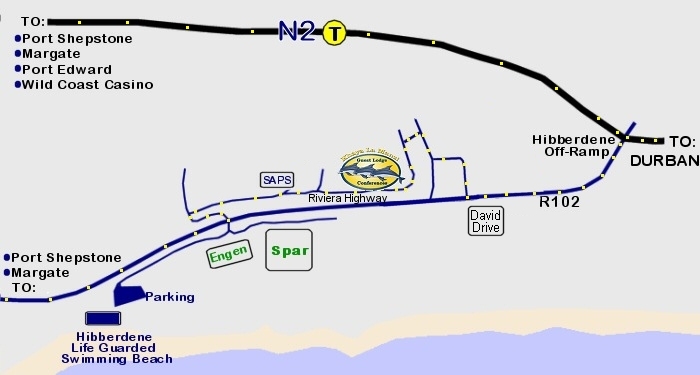 Take the Hibberdene R102 exit (old Main Road). David Drive signboard, turn right into David Drive and follow the Khaya LaManzi signs. Travelling from Port Shepstone on the N2 take the Hibberdene exit. for ± 22km crossing the Mzimayi River Bridge entering Hibberdene. the road past SAPS up the hill for 500 metres to Khaya LaManzi on the left hand side.